I usually try to ignore “Amish Mafia” or “Breaking Amish“-related news, which tends to clog the news feeds whenever the shows are in season. I am making an exception today to share the good news that “Amish Mafia”‘s upcoming fourth season, beginning February 10th, will be its last. The two popular Amish-themed “reality” programs have received a fair share of backlash since they made their debuts in 2012, including articles debunking Amish Mafia and non-Amish speaking out against “Amish exploitation”. By the way, I somehow got sucked into visiting the “Amish Mafia” website, and learned some interesting things via a “fact generator” feature on the website. During Rumspringa, children between the ages of 14 and 16 are given greater personal freedom and allowed to form romantic relationships. Lancaster Amish are required to wear suspenders, but in Ohio only the bishop, the deacon and boys under age 12 may wear them. Everyone in Lancaster gets their head coverings from one woman who provides them. The Amish will occasionally maintain friendly relationships with English people. Amish etiquette dictates that a person must ask permission to enter another’s house. Bundling is a traditional Amish practice of wrapping two people separately in a bed. An Amish horse and buggy can travel up to 40 miles per hour. A brand new Amish buggy costs about $5,000, and a used buggy about $2,000. Usually there is one buggy shop in each Amish community. An Amish woman is forbidden from allowing a man in her house unless her husband is at home. In the Amish community, men and women are segregated until Rumspringa. Although there are no official Amish communities in North Dakota, many Amish people relocate there to continue their modest lifestyles. I actually found that pretty entertaining in its own way. For a lot of these, you can imagine the kernel of truth that each “fact” grew from. I think my favorite is the description of bundling. What do they use? Tin foil? Saran wrap? Wrapping paper? Does it take an entire team of Amish people? Pretty funny visual image in that one sentence. You wonder what might replace “Amish Mafia”, assuming the “Amish reality” theme remains popular. There are actually a couple of other programs currently airing. One is called “Amish Haunting“, which consists of re-enactments of ghost stories which supposedly circulate among the Amish. I didn’t realize there was such a strong supernatural tradition among the Amish as the show’s intro would have you believe. The other is named “Amish RENOgades“. The “RENO” bit looks as it does to indicate this is a home improvement program, following two Amishmen (or maybe just one, since one of them drives) as they traverse the country doing renovation projects for homeowners. I’ve only watched a little of either of these. From what I saw, each seemed silly in its own way (though RENOgades seemed like it might be interesting for home improvement buffs). Any comments from those who have seen either? I was also contacted by the casting director for some other Amish “reality” show and then asked by Breaking Amish to participate in a small way. I decline both, and suddenly got amnesia when they asked me if I knew of ex-Amish who might want to participate. Sorry (well, not really), but I haven’t watched any of the craziness you mentioned. When there is a total lack of reality in any ‘reality TV’ show — I’m pretty much out from the get-go anyway. And then the (IMO) disrespect/misrepresentation toward what I know the real Amish are — I’m just not a fan. But I fear that you are right on your wonderings about what will replace it. What the Bible wedding steward said about refreshments at a wedding is arguably also true of what is served up on TV: The best gets served first, and when that runs dry it is only replaced with the more inferior stuff. Sure makes one dread to see what’s comin’ ’round the bend. I tried to watch some of an Amish Haunting episode for this post, really not sure what is going on there. My quick take is it looks like they are splicing the Amish and horror genres in a similar way to Amish Mafia splicing the Amish and mob genres. One woman who was supposedly an Amish woman seemed very very English, while one or two other participants seemed Amish or probably more likely, Amish-raised. Anyway, I am not a big watcher of TV anyway, but maybe I will make myself delve into this just to know better what is going on with these shows. Can’t say I’m looking forward, but maybe it will be good for some laughs as some of this Amish Mafia stuff has been. I’ve got some connections (of somewhat questionably reliability) in the TV programming area, and here’s what I am told are some shows being considered for upcoming seasons….. The Real Housewives of Lancaster County – In the first episode Miriam and Rebekah aire their once-dirty laundry, Mary gossips at the phone shanty, while Kathy and her mother-in-law fight over who has the best quilt pattern. The Amish Apprentice – Donald Trump weeds through would-be workers for the pallet shop and country store. Honey BooBoo and Her Amish Nanny – Please note that this show has been *canceled* after the taping of the first episode when Honey BooBoo was taken out to the woodshed for the years-overdue spanking which has made her a tolerable little tot once more. There is, however, a proposed and highly-anticipated sequel in which BooBoo’s *mother* is taken out to the woodshed and spanked for allowing the child to act like she did in the first place. The Dudes of Shipshewana – Bo and Luke Gingrich, under the ever-watchful eye of Uncle Mose, outsmart the bumbling local authorities who are always in hot pursuit of them and their high-horsepower antics. Pawn Stars Goes to Holmes County – The crew of Pawn Stars returns again to their shop in Berlin. In the first episode Joe Graber comes by to pawn his coat, and the cast waits as Rick calls in his buddy who is an expert in Amish coats. These are some fine proposals Don. Tell your friend I think they ought to greenlight the Dudes (Dukes?) of Shipshewana 😉 Though might have to find a network besides Discovery because it sounds like they’re cleaning up their act. This is a tad off topic but, did you know there’s a new genre of Amish fiction? It’s Amish Vampires! Seriously! Back to Amish Mafia, I personally know Mary Troyer, the heavy gal who appeared in a few episodes. I didn’t watch, only caught the tickler ads for the show. Mary is kind and funny. Don’t know how she was portrayed on the show but, she’s a nice gal who truly was Amish. Love this! Sad part is that it could happen! I wanted my response to be to Don Burke’s potential new tv shows list! Very funny. Sad thing is these shows may show up! Things we learn from Amish Mafia? I almost spit my coffee out! That’s crazy! I am glad to hear this show is coming to an end, but not very happy to find out there are more coming. “An Amish horse and buggy can travel up to 40 miles per hour” Man, I want one of those… Does it run on Nitrous? Or just feed the horse some kind of super-GMO-ultra enhanced oats? “Everyone in Lancaster gets their head coverings from one woman who provides them” That lady must have fingers that sew like the wind, 24 hours a day, seven days a week. What’s next? Aliens vs. Amish? Attack of the Amish Zombies? The 40 MPH horse… Yes, where can I get one? I’m laughing just trying to picture this — such a horse would make a HUGE difference! Debbie the Taxi Driver would get a lot less business, though. Ha! Coincidentally, there are the same number of 40 mph horses in Holmes County as there are sawed-off shotgun toting Amish Mafiosi in Lancaster County. Ha ha PC! But the sight of a horse & buggy on back of a trailer going 40 MPH might scare some people into thinking it’s Amish mafia on their get-away, don’t you think? Forest there are some other good ones on there, I didn’t get through all of them-it randomly generates a new “fact” with each click, and some repeat. The problem is they are not all outlandish, some are true, some more-or-less true, and some SEEM like they could be true or match what people might be predisposed to believe. I was clicking the fact generator button for a while this morning and kept finding new nuggets of “wisdom”. If anyone finds good ones I missed let us know. On the list you posted, I saw one that was true. That is Amish people have have some close or friendly relationships with non-Amish people. A few had some truth, like buggy costs, but then messed up saying there is one shop per community. Most had no truth to them at all. Definitely, some were silly and wrong, but some did have truth, and actually a lot had at least a kernel of it. This list is a mix of the wacky and the simply misleading. Leaving aside the absurd ones like 40mph Amish horses, the problem with even the somewhat truthful ones is that they are just given as glib factoids with no further explanation. I included the one about English friends because they make it sound like it is a rare thing that Amish are cordial to the English: “The Amish will occasionally maintain friendly relationships with English people”(their words reproduced verbatim). It’s not the most egregious, but still this is “off”. I think it’s safe to say that many Amish maintain friendly relationships with English. Also, their wording is funny or misleading. “Bundling is a traditional Amish practice of wrapping two people separately in a bed.” Or “Amish etiquette dictates that a person must ask permission to enter another’s house.” As if it’s a formal custom like taking off your shoes in a Japanese home or soldiers saluting one another. I feel like whoever created this probably just scoured the internet and sloppily reproduced things that sounded interesting from various websites plus random stuff harvested from what actors on the program claim during the show. Agree Mark. I talked at length with Josh (my “adopted” nephew who is ex-Swartzie) and wrote a blog post about the cost of horse & buggy ownership. Josh (real name Jonas) was one of his settlement’s buggy repair men. He said a good road horse and buggy can cost a family $10,000. Actually I hadn’t done anything on Amish Mafia for a year or two so it was good to clear the air again. As annoying as this fact thingy is, it is also kind of funny. I know some Amish people are bugged by the show, some don’t pay it attention, and some joke about it, which seems healthy to me. 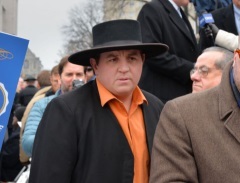 Amish Mafia? Good riddance. Not all Amish are saints, but the show was extremely distasteful and offensive. The falsehoods it propagates harm many good people. Forty mile an hour buggy? How do I do that? Ignite the methane coming out the horse? Vanilla Ice Goes Amish is actually a well done home renovation show. I’m not into rap music, so have never followed his “music”, but he is also a contractor. However,I do question how “amish” a few of the guys working with him are. Amish RENOgades is also a renovation show. Have enjoyed watching it. But, still question what kind of Amish that Albert Miller is! Didn’t watch the show, but from what I heard Vanilla was pretty respectful of his Amish culture and his co-stars. For me that type of program is a whole different animal than the scripted fictional pseudo-reality programs. Still not where I’d recommend someone base their knowledge of the Amish, but probably not that bad. I am single if Albert is. He is HOOT!!!!! As with most things, it’s all about the money. Obviously, The shows producers and holding companies are making money at the expense of the Amish. Disgusting as it is, it is what it is and is what I would guess is why most here are angry that this type of exploitation takes place. This is nothing more than the thief who steals from the Amish because they know they won’t resist. What a shame and shame on the producers and viewers who actually take pleasure seeing it. It’s just kind of insulting that they defend this as real. Of course they have to, to keep a veneer of believability for the viewers. The sad thing is that people are believing this stuff and the shows are really sick. They would be considered sick and twisted on the worlds terms as much as the Amish. When we were visiting our Amish friends in Berlin, OH, we talked about Amish Mafia. They said they had never heard of such a thing, and the Bishops of the Amish where these Amish claim to live, would put a stop to this in a hurry. I’m glad the show is being cancelled. Didn’t even need to see the show to have my eyes roll back in my head. BA had enough holes in it but AM, from the first commercial, was so fake it made The Wizard of Oz seem like a real-life National Geographic documentary! …maybe, if the horse was Pegasus. I watched Amish Haunting only a few times and thought it was junk; as I asked my Amish (Auction) friend about dolls with faces and the devil. He told me that his daughter has a few cabbage patch dolls and they have not rotted out yet. Got to enjoy that Amish humor. By the way LOVED!!!!! Loren Beachys’ book, and the pranks they pull on each other. A few weeks back i read an article about the discovery network, a new guy took over and said he was getting rid of the gibberish shows they have been airing. They have to honor the shows that are already in place to show. I bet he is the reason this is the last season. “Amish Mafia” is not mentioned by name in the article, but a show called “Eaten Alive”, a special that was supposed to show a man eaten alive by an anaconda, is. It sounds as though the writer(s) of the ‘fact generator’ has/have read that thoroughbreds can reach 40 mph at a full gallop and assumed that the same is true for a horse and buggy. I suspect that even if a horse pulling the weight of a buggy could reach that speed, the noise and vibration would be very uncomfortable for the driver and passengers, and that controlling the buggy at that speed would be extremely difficult. Hmmm…. Sebastian K. trotted a mile in 1:49 with modern racing shoes, modern sulky, on the modern track at Pocono. Pet Rock managed a mile in 1:48.1 pacing two rounds of a half mile oval. Neither one of those went 40 mph. The trotting and pacing fraternities would be camped in Lancaster if anyone had a 40 mph buggy horse. As I understand it, the fastest movement by a horse was a Quarter Horse in a short sprint doing the “cross” or rotary gallop at 54.7 mph. Note that this isn’t even a normal horse gallop – racing Quarter Horses are deliberately trained to do what is in essence a cross canter, a rotary gallop like that of a dog. It is NOT a pleasant ride. It is also not suitable for harness. “All Amish clothes are handmade. Each community has a local seamstress who makes suits and dresses”. Does she sell them on eBay too? “The handles of a buggy will be chrome if a person is on Rumspringa and black when they have joined the Amish church”. “Many Amish churches prohibit bicycles but allow non-motorized scooters because they require more manual labor to get around”. Finally an answer why bicycles are prohibited with pedals! “Amish buggies require little maintenance, needing only brake fluid”. “The Amish prefer not to have English people attend their parties because it is more likely that a fight will break out”. “An Amish bundling bed is a bed with a board in the middle to prevent touching. It’s not uncommon to see bundling beds in modern times”. Really ? Saran wrap sounded friendlier. Maybe that’s where the sleeping term “sawing wood” came from! “Most Amish will not turn a pitchfork upside down because it reminds them of the devil”. Could be for safety issues, Anyone? “The term “Amish Chicken” is associated with free-range chicken, but many Amish chickens are not raised in a free-range environment”. So does a free-range chicken have to speak Dutch to be Amish? “The Amish believe the outside world is moral pollution”. Nice work Paul. Some good ones in here. I wonder where they got the pitchfork idea from. Maybe something to do with braucherei beliefs. I just discovered that I must be Amish! We never, ever, ever, entered someone’s house without permission. We called “Hello the House” when we pulled up in someone’s yard so they would know we were there if they were out in the barn. And all this time I thought my Dad was a Lutheran and my Mom a Unitarian – and we were secretly Amish. That might explain why I know how to make pickles, sauerkraut, and can fruits and vegetables. Will wonders never cease. I believe that the brood stock Dominiques for several hatcheries are raised by Amish farmers. One would think that Discovery.com would insist that an Amish chicken would have to be some traditional German breed, and it would have to at least understand “Pennsylvania Dutch” which linguistically is now considered a Creole or a dialect of English by some scholars. Now, understand that Dominiques are the oldest chicken breed in the US, and may actually have descended from some very early birds at Plymouth, Rhode Island, and in the Bay Colony. Mine, despite long association, do not seem to speak English, although they are quite happy to inform me of how their day went, loudly and at length. The chrome buggy handles is interesting; all this time I thought that the buggy morphed into a Corvette for Rumspringa. This last Saturday evening I was in the Clintenville Pa. area around dust. On the other side of the road I saw what looked like a dog running down the grade.When I got closer it turned out to be a very small pony pulling a small wagon with four wheels and two young amish lads. This little pony legs were doing 80 mph; but his body was likely moving about 15 mph. Quite the site. Thanks everyone for the laugh. When I first heard Vanilla Ice and Amish in the same title I rolled my eyes. When I heard Amish Mafia my eyes did a 360. Dereck J- then “Shame” on me for being a viewer in all these “Amish” shows!! For me, It is a pleasant distraction to all the other cops, Sci fi, “Reality” TV crap that is on!! What I choose to believe is my perspective! I don’t shame others in what they choose to view on TV! Whether it is legit or not! If I want to view legit Amish culture via the television, I’ll watch PBS or the discovery channels! I worked on the set of The “Amazing Race” REALITY series (when some of it was being filmed in SEATTLE WA area a long time ago) and I know first hand REALITY TV shows are staged!!! So everyone picking apart these Amish shows… Feel free! The only thing that did cross my mind while watching “Amish Mafia” is… If the Amish take care of their own.. Then what does really happen if say- someone is taking advantage of a widow; or someone needs to borrow a large amount of money and or can’t pay it back, or someone is being disrepectful of the rules and regulations within their community etc!?! You get my drift! I have never been aware of the “Bundling” practice before until it was shown on AM. I wanted to learn what it all really entailed (not caring what community does or does not practice it) so I googled it! Enough said! I will say “Vanilla Ice goes Amish” (and yes his music was in my life at one time) is not disrespectful! If he found a family that was willing to house him and be filmed then what is so terrible a out that??!! He is doing nothing wrong or false! He is making people happy by helping them with their residences!!! So I will stick up for his TV show!!! I watched a couple of episodes of the Amish Mafia a year or so ago. The sad thing is that even pretty intelligent people (my Mom & Sis) think that what’s on the Amish Mafia is pretty much true, as is. And Albert is a nice man on Renogade Amish…but, have you noticed his home as he leaves…seems a bit fancy for an Amish home. While much of the work was done well-enough, I can’t help but think some Amish carpentars (who obviously aren’t watching the show) would take issue with the way he tackles some of the projects. I have to tell you, Albert’s deliberate way of talking — which seems scripted and “put on” grates on my last nerve at times — it just doesn’t seems real. Amishology is a card game with questions about Amish life. I must admit I have watched several of the Mafia shows. One reason was to see the beautiful scenery, brings back memories of Pennsylvania and another reason was to laugh at those silly wimps that would drop dead of fear if in the presence of a real Mafioso!